Lost Dog Toolkit – Resources to Find your Lost Dog – ComeHereBoy! When you have a lost dog, it’s easy to find yourself frantically searching the streets for him yourself, calling his name and feeling discouraged when nothing turns up. A lost dog can be so hard to find and even if you have a normally friendly dog, he can turn into a frightened animal that scampers away when approached on the street. Here are some resources and tips for helping you quickly and easily find your lost dog. Don’t spend time trying to make a flyer in Word. Use this flyer generator to make it easy to give thorough information on your lost dog. It even includes tearable tabs at the bottom for people to take, so they don’t need to take the whole flyer down. Put your flyers everywhere in the city. Ask your friends and neighbors to help you post them around town. Drop a flyer at the shelter, the vet, local parks, pet supply stores, grocery stores, local businesses with glass window fronts that will post it in view of shoppers and near schools where kids can see it. This lookup tool will help you find your local shelter. As soon as you know your dog is lost, contact the shelter and give them a description of your dog so they can contact you immediately if he is found. Also contact rescue groups in your area and animal control (usually by calling police dispatch). Put a lost dog ad on Craiglist and on your local news sites classifieds. Post it on Facebook/Google +/Instagram, etc and ask your friends to share the information. If you’re not already part of one, find your city’s Facebook groups and join them and post your ads there as well. Your shelter might also have a Facebook page that you can post on. Free for a listing with a generic picture, $5 for one with a picture. This database is extensive and is one of the first things that comes up if you’re looking for ‘lost dog’ on Google. Certainly worth the $5, in my opinion. Nothing catches people’s attention like a reward, whether they plan on accepting it or not. 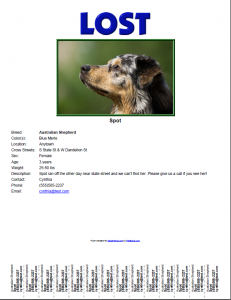 A reward makes your lost dog poster stand out from the others. From experience with trying to get my frightened lost dog to come to me once I found her – bring really really good treats with you when you’re out searching. I’m talking chicken liver, sausage, stinky smelly yummy real meat treats that will get your hungry dog to come straight to you. Also, crouching down and speaking softly, or actually turning and moving away while calling them instead of chasing them can be more effective ways to get your dog to come to you. 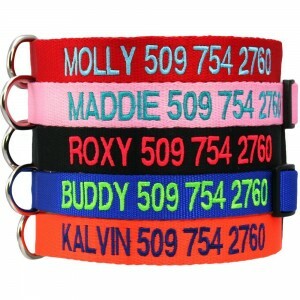 I really recommend purchasing the safety dog collar pictured here. It makes it really easy for people to see your phone number when they spot your pet, even if they can’t get hold of him. If your dog gets lost often, consider purchasing a GPS system (this is for the Tagg GPS system, which has decent reviews) or having your fence redone. Microchip him at the vet, in case he loses his collar. Good luck on finding your lost dog! Remember, most dogs are found within a week of being lost, so don’t feel discouraged. Are there any resources I’ve missed?